never thought I would find another person who disliked foods because the "thought" of them was just gross. I love the smell of eggnog too but cannot stand to actually put it in my mouth...ewww! Thanks so much for the recipe, I'm definately going to try this! Are you gonna show us "whipped up art cases???" Huh, huh, huh??? Tell and show! I made this eggnog bread to take to my parents house Christmas Eve. It turned out great and was SO incredibly yummy!!! There's always silk nogg. It rocks. No yucky stuff in it. Really - it sound syucko, but it's goood. LOL! 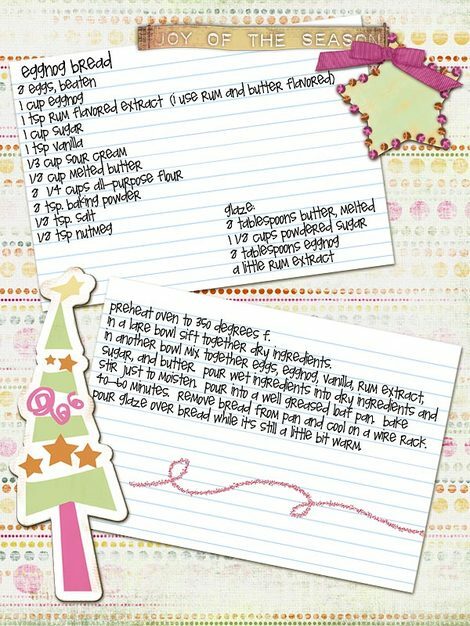 That is totally my handwriting - i came across your website and i love recipes and lo and behold.. there is my handwriting!